I have forgotten my super admin password. How can I reset the super admin account password? I have access to both FTP and phpMyadmin how can I change the Super User account password? From the joomla docs How do you recover or reset your admin password? Using a text editor open configuration.php and add the following line. Substitute myname to a name of an account with administrator access that you know the password. Save the file configuration.php and upload it again via FTP to your site with file permissions 644. This user will now be a temporary super administrator. 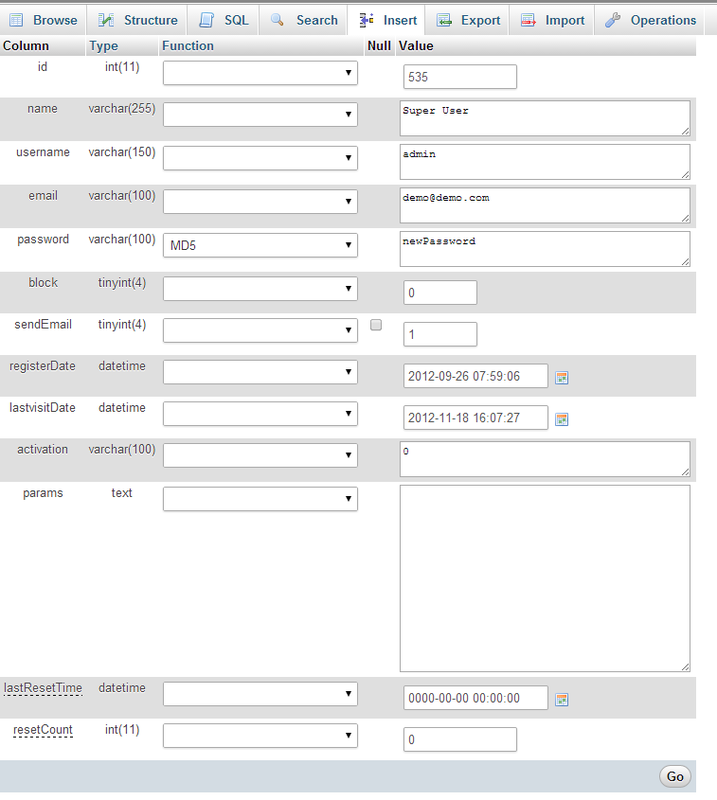 Login to the backend with the above account and change the lost admin's account password. You can also block or delete the old and create a new one instead. When finished, make sure to use the "Click here to try to do it automatically" link that appears in the alert box to remove the line that was added to the configuration.php file. If using the link was not successful, then go back and delete the added line from your configuration.php file using a text editor. Upload the configuration.php file back to the site. Using your FTP program verify the file permissions of the configuration.php file, they should be 444. If you manually removed the added line, then change the file permissions on the configuration.php file to 444. After you gain access to your account you should immediately change the password to something secure as the above is public and supplied only for recovery purposes. Joomla uses the Xyz8_users table for storing user data. After changing the password with SQL, log into Joomla and it will be converted to an update passwort hashing method. you should look for table Xyz8_users. Find the "password" row and click on the select box under the "Function" column. Select "MD5" and type the new password in "Value" textarea. Click the "Go" button at the bottom of the page and you voila, your password is changed. Select the record for the Super User account (the Super Admin account has an ID of 62 or 42 by default). Copy and paste a known MD5 hash (one of the longer character strings below) into the password field. Log in to the back-end of your website with the new password, "admin" or "secret" or similar from above. Once logged in, you can reset the password to anything you like. "new_password" - replace this with the new password you wish to use. "admin" - replace this if your admin username is different. Click on the GO button to submit the query. There's also a tool available for Joomla 2.5 (haven't tested with Joomla 3): http://myext.eu/en/j25-login It's simply a PHP file that you upload to your /administrator/ folder and visit in your browser. WARNING: remove the file after use! It is possible for recover the admin password. Two ways to recover the admin password. Edit #__user table in database. 1.Navigate to phpMyAdmin and select the database for the Joomla! site in the left-hand drop-down list box. This will show the database tables on the left side of the screen. 2.Find and click on the table with "_users" appended in the list of tables (note: you may have a prefix that is not jos_, simply go to the _users table for your prefix). 3.Click on the "Browse" button in the top toolbar. This will show all of the users that are set up for this site. 4.Find the user whose password you want to change and press the Edit icon for this row. 6.Log in with this user and password and change the password of this user to a secure value. Check all of the users using the User Manager to make sure they are legitimate. If you have been hacked, you may want to change all of the passwords on the site. Not the answer you're looking for? Browse other questions tagged joomla-3.x phpmyadmin account-password super-user or ask your own question. How destroy specific user session when we are using default php session handler? Joomla works without my new ftp password, how that's possible? How to hide “Super Users” from Users Manager list in the Joomla backend?